My son was part of an Earth Art Event in downtown Los Angeles. They spent the morning laying out thin solar panels and copper strips to form an outline of the solar eagle. Here below are some images from the event. It was a challenge due to the winds. Everything had to be down before the satellite and the helicopter flew over to take the picture. The helicopter started filming for 45 minutes. In case you didn't know it,late last month, our refrigerator stopped cooling down. There was water all over the floor and the refrigerator was over 50 degrees. With a good repair, a new part (took a week to get), the refrigerator was on its way to being back to normal. But wait! Two weeks of pleasant temperatures, frozen ice, and a cool refrigerator had quickly come to an end. It is odd because it was exactly two weeks after getting a new compressor that the refrigerator decided to do the exact same thing. With a new phone call and a quick analysis, everything was fixed once again. This time it was a clogged tube-the tube that carried the refrigerant. Everything is fine once again. But wait! This relief lasted only two days. We think that everything was fine so we start to put groceries back in the refrigerator, but soon discover that the refrigerator is warm once again. This time, the temperature fluctuates from 34.1 up to 55 degrees. With a phone call, the same tech is back at the house. This time the refrigerator is back down to a normal temperature and stays that way. Well, the tech can't fix something that isn't broken. So, dh brings home the groceries from their storage place, only to discover that the process has started all over again. We kept a log just as the tech wanted us to, which indicated the temperatures and the noise level. The temperature slowly rises up to 57.1 degrees then it begins once again at the bottom and climbs again. The thing that we liked about the refrigerator is that there are four sections that are individually controlled. The bottom left drawer can be used as a freezer or as a refrigerator. To truly understand the meaning of the Turkey Tussle, this is a must see video. It is a HUGE thing around here that two schools look forward to each year. It is the annual Turkey Tussle Football game between two rival high schools: John Muir High School and Pasadena High School. I attended my first Turkey Tussle football game when my youngest son played in the John Muir marching band. It has been a long time since I have been inside the football stadium at the Rose Bowl and I forgot how challenging it was for tall people to sit in the seats. Last night was the game that all the current students and past students geared up for, when the winner would covet the victory bell for another year. It is an entire year where the winner has bragging rites of the other rival team. John Muir has been a winner over the Pasadena High School football team and this year was a landslide victory. We won 66-6. I heard this song for the first time today. Great song by Amy Grant. I would put the video up on my blog, but I don't know how to do it, so that is why I linked it. As many of you know, I do a lot of sewing. 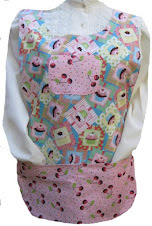 I especially make a lot of aprons, meaning that I usually have a lot of fabric scraps. I used to have a source of women who wanted me to send them the scraps, but the downside was that it cost to ship and usually they paid for the shipping. They were happy to pay for the shipping because of the large variety of quality fabrics that were shipped. I found another source, since these ladies are up to their ears in scraps. The organization is called "Project Linus." I was fortunate to find a local chapter to donate the scraps and fabric yardage to. Arriving at the meeting place today, I was flabbergasted. In the large room there were so many sewing many sewing machines, and there were not only women sewing quilts, but women crocheting blankets. There must have been at least 100 women there sewing. I could be wrong on this since I am poor at calculating, but besides the large room, there was another room filled with women as well. Since the Project Linus organization began in 1995, they have made over 3 million blankets for children in need. This is absolutely amazing to me. If you sew, crochet, or knit, I urge you to check out the Linus Project, and if you have spare time, maybe you can donate your time making blankets for such a worth cause. My husband and oldest son were just sitting watching television this evening. My husband said, "What is that crawling on the floor." When I first saw the ugly insect, I thought that it was a potato bug, but how did it get in the house? My son did some research on the Internet and that ugly insect that I thought that was a potato bug was actually called a Jerusalem Crickets Ugliest thing I ever saw. Of course our dog was very interested. This isn't the actual Jerusalem Cricket that was in the house. My son wants to take a picture. Go Figure! We have lived in this home for 25 years and I never have seen anything like this before. I am still curious how it got inside our house. What we found out that it is native to the Western United States and that the early rains are drawing them out of their burrows. There have been a lot sightings since our recent rains.